Low price 1500w power inverter with pure sine wave output, a good option for charging refrigerator, laptops and much more home appliances. Tips: What is inductive load? Generally, inductive loads are the electrical power products manufactured under the principle of electromagnetic induction, such as induction motors, refrigerator, compressors, relays, fluorescent lamps and more. These products require a higher starting current (about 3-7 times higher than the normal operating current) during startup. For example, a home refrigerator normal operating consumes approx 300 watt, the starting power is up to 1500 watt or even higher. In addition, due to the inductive load will produce electromotive force voltage during the moment of power on/off, such peak voltage is higher than the voltage of the pure sine wave power inverter can withstand, it is easy to cause the sine wave inverter instantaneous overload and affect the service life of the power inverter. 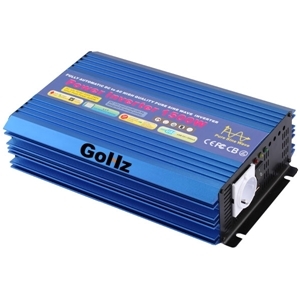 I would like a 12v dc and 24v dc input and 110v ac output inverter pure sine wave at 1500 watts operation range in one unit. Can this be done? No, it is only one input voltage, 12VDC or 24VDC.